Client Description: Fast . Causal . Greek . 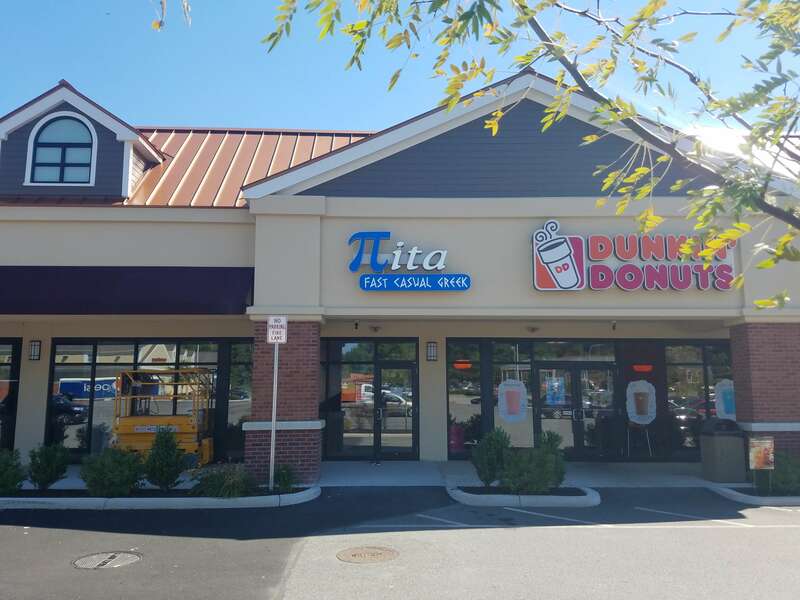 Pita Restaurant specializes in the most famous Greek street food, the Gyro! They also offer salads, soup, dinner plates, rice bowls & Baklava! All menu items are home-made with the freshest ingredients, starting with our delicious Pita bread. 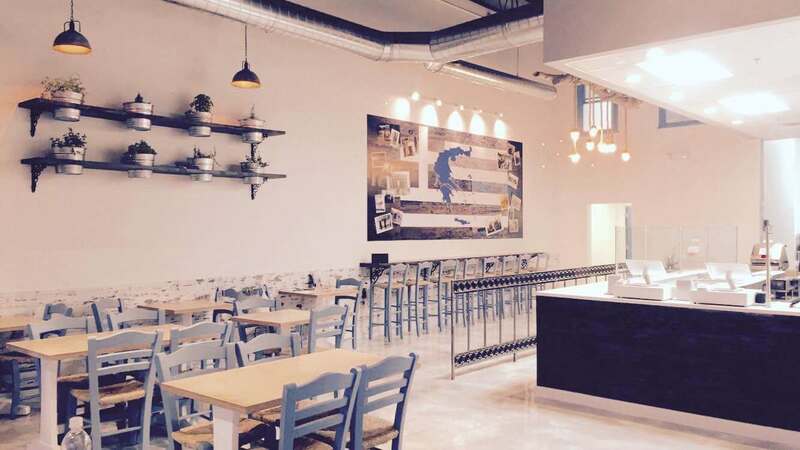 To create artwork and signs that would easily inform local traffic that the restaurant specialized in casual Greek food. Also, to design and install the artwork and signs before the grand opening in Fall of 2016. The Client had an idea for their logo. 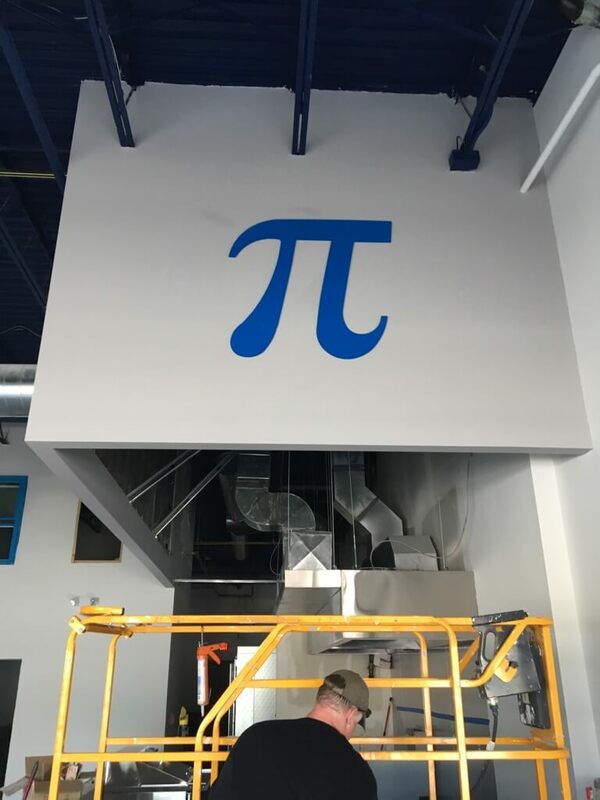 We created the Pita sign design using their concept of using the Pi symbol in place of the P in Pita. The blue color was developed with the client because of the blue color in the Olympic symbol and it’s refreshing color. The blue is also carried throughout the restaurant in other features such as a mock window overlooking the eating area that gave a feel of being in a Greek Village. The wall mural was a concept the owner had to showcase some pictures of his family. The pictures were older and had a nice authentic feel to them. 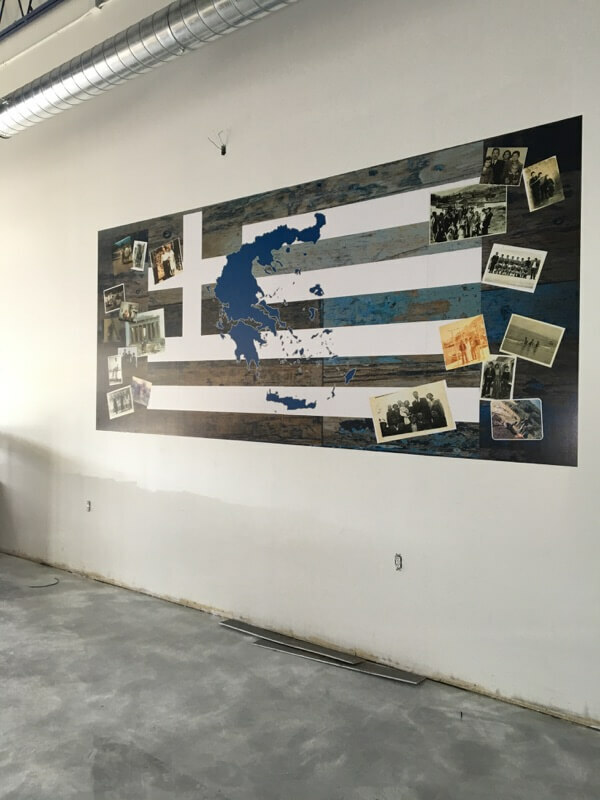 The background used in the mural was developed by our graphic designer using a combination of the Greek Islands and the Greek flag. The photos were imposed over them. The client loved the final result of the mural as it filled a large white wall area and brought reminders for him and his family of their heritage. Sign Permitting: Our main challenge on this project was a new bylaw in the town that required the calculation of the amount of light output the sign had. With many towns changing their bylaws to better enforce the “Dark Skies” initiative, we will probably run into this again. The problem was the calculation the town was looking for was not possible to provide prior to building the sign. The sign had to be built to properly measure the light output numbers they were looking for. This of course was not possible until the permit was approved.